In October 2018 the New Plastics Economy launched a Global Commitment to eliminate plastic waste and pollution at source. It was signed by 250+ organisations, representing 20% of all plastic packaging produced globally. Thursday 21st June sees the Ellen MacArthur Foundation return to the iconic Roundhouse in London to host its sixth Summit, welcoming guests from across the Foundation’s network of business, academia, government and media. Make Fashion Circular aims to create a thriving industry based on circular economy principles. Pioneering national implementation initiative is part of a global solution to plastics issues. Players of People's Postcode Lottery expand support of the Ellen MacArthur Foundation. The Ellen MacArthur Foundation enters into a new agreement with the United Nations Environment Programme (UN Environment), the leading global environment authority, to scale up and accelerate the shift towards a circular economy. Winners of the $1 million Circular Materials Challenge are announced by the Ellen MacArthur Foundation and NineSigma at the World Economic Forum Annual Meeting in Davos. Solvay has joined the Foundation as a Global Partner to accelerate the transition to a circular economy in the chemical industry. The Foundation attended its seventh World Economic Forum meeting in Davos in January. The internationally renowned Annual Meeting welcomed government leaders, ambassadors, and over 3,000 business representatives to Davos. In November 2017, Ellen MacArthur and Stella McCartney co-hosted the launch of the Ellen MacArthur Foundation’s new report 'A new textiles economy: Redesigning fashion's future' in London. This report calls for the fashion industry to adopt this new vision and create cross industry collaborations to achieve it. Winners of the $1 million Circular Design Challenge announced at Our Ocean Conference in Malta. The Challenge focused on the 30% of plastic packaging items that are either too small or too complex to be recycled and often find their way into the ocean, for example shampoo sachets, wrappers, and coffee cup lids. More than 600 innovators from over 60 countries from across the world participated. MAVA, a family led philanthropic foundation with a key focus on sustainable economy, joins as the Foundation's second Core Philanthropic Partner. The Schmidt MacArthur Fellowship will develop for a further three years, thanks to renewed support from Wendy Schmidt and The Schmidt Family Foundation. The Foundation brings together key industry stakeholders to build a circular economy for textiles, starting with clothing. The prize launched alongside the Prince of Wales's International Sustainability Unit, aims to help keep plastics out the ocean. Produced in collaboration with the World Economic Forum as part of Project MainStream. This new scoping paper focuses on the significant volume of organic waste flowing through urban environments, and highlights opportunities to capture value in the form of the energy, nutrients and materials, by applying circular economy principles. The Ellen MacArthur Foundation and IDEO launch the new guide at Davos which enables change makers, entrepreneurial innovators and students to get to grips with the circular economy. Launched at the World Economic Forum’s Annual Meeting in Davos in January 2017, this new research presents three strategies to increase reuse and recycling of plastic packaging to 70%, from today's recycling rate of just 14%. Launched at the World Economic Forum's Annual Meeting in Davos in January 2017, the report finds that scaling the circular economy in Europe offers investment opportunities totalling €320 billion in the food, mobility and built environment sectors. The global food company embarks on a three-year partnership to further embed circular economy principles both inside and outside its organisation. SYSTEMIQ, an advisory, business building and investment company, is announced as the Ellen MacArthur Foundation’s Knowledge Partner for Systems Initiatives. The Foundation enters two strong partnerships in education to support its work in inspiring a generation to rethink the future. A Knowledge Partnership with leading design and engineering firm, Arup, is announced at the Foundation's CE100 Annual Summit in London. The Ellen MacArthur Foundation welcomes Stiftungsfonds für Umweltökonomie und Nachhaltigkeit GmbH (Foundation for Environmental Economics and Sustainability), or SUN, as its first Core Philanthropic Partner. NIKE, Inc., the world’s leading designer, marketer and distributor of authentic athletic footwear, apparel, equipment and accessories, becomes the latest Global Partner to the Ellen MacArthur Foundation, demonstrating the company’s commitment to become a key player in the network of organisations supporting the transition to the circular economy. The second book in the 'A New Dynamic' series, A New Dynamic 2: Effective systems in a circular economy, reflects on the necessity to develop a whole-system approach to re-think our economy. The Foundation announces the creation of its Circular Economy 100 USA (CE100 USA) programme, and holds its inaugural workshop in March 2016 in San Francisco. SunPower, Tarkett and Wal-Mart Stores Inc. join the CE100 USA network at launch. The Foundation's latest report, produced as part of the Project MainStream collaboration with the World Economic Forum, finds that pairing circular economy principles with the information generated by intelligent devices creates a fertile ground for innovation that could enable the decoupling of value creation from the consumption of finite resources. The report provides, for the first time, a vision for a global economy in which plastics never become waste. It was produced under the umbrella of Project MainStream, a CEO-led collaboration between the World Economic Forum, Ellen MacArthur Foundation, and McKinsey & Company. The Foundation signs a new Design Partner agreement with global innovation and design firm, IDEO. IDEO, led by its London studio, will work closely with the Foundation to apply design thinking and expertise to help capture opportunities presented by the circular economy. Italian banking group Intesa Sanpaolo becomes the Ellen MacArthur Foundation's latest Global Partner accelerating the transition to the circular economy. In its role as a Global Partner, Intesa Sanpaolo will help to redefine business strategies to capture new opportunities, and will ensure financial support for investments used to re-design the industrial system. "Difficult access to finance is consistently quoted among the barriers that entrepreneurs wishing to innovate with circular models find themselves up against. By recognising there is a new economy emerging and by creating tools to help it, Intesa Sanpaolo actively contributes to the transition and takes a leading role in this new world of opportunities." H&M becomes the Ellen MacArthur Foundation's latest Global Partner accelerating the transition to the circular economy. The partnership builds on H&M’s commitment to demonstrating circular innovation within a key economic sector. As one of the world’s largest fashion retailers, H&M has the potential to fundamentally shift the extent to which the clothing sector restores and regenerates fabrics and fibres for productive use. "Operating in a key sector of the global economy, H&M’s vision for applying circular models represents a significant opportunity to scale up the transition. We are delighted to be working with H&M to build momentum towards the system shift that our economy needs to work in the long term." The Disruptive Innovation Festival 2015 broadcasts its first live streamed sessions at thinkdif.co. The Festival runs from 2-20 November with over 200 contributions from around the world, showcasing the people and innovations changing 'business as usual' in their fields. The Ellen MacArthur Foundation's key Circular Economy 100 programme expands internationally, with the launch of CE100 Brasil at the headquarters of Natura, near São Paulo. The CE100 Brasil is tailored to organisations for which opportunities lie primarily in the Brazilian market, and builds on the successful format of the international CE100 programme. Google becomes the Foundation's latest Global Partner accelerating the transition to the circular economy. “Google’s ambition to lead the way on the circular economy represents a step-change opportunity – we are thrilled to be working closely together with such a visionary, innovative and transformational partner on this journey”. In ‘The Circular Economy: A Wealth of Flows’, published by the Ellen MacArthur Foundation, Ken Webster argues that our linear ‘take-make and dispose’ economy is a 19th century heritage adrift in the 21st century reality. The time is right to move towards a circular economy – a regenerative model based around feedback-rich flows allied to new business models. The Ellen MacArthur Foundation launches the results of its latest research which provides, for the first time, an actionable toolkit for policymakers who wish to embark on a circular economy transition. The toolkit complements the recently published report Growth Within: A circular economy vision for a competitive Europe by offering an actionable ‘how-to’ guide for policymakers inspired by the vision of how the circular economy could look, as explored in the Growth Within report. ‘Delivering the circular economy – a toolkit for policymakers’ is the result of a collaboration led by the Ellen MacArthur Foundation, with the Danish Business Authority and the Danish Environmental Protection Agency as key contributors, especially in a pilot study of Denmark. The Ellen MacArthur Foundation, the McKinsey Center for Business and Environment, and SUN (Stiftungsfonds für Umweltökonomie und Nachhaltigkeit), present the results of a major new study at the European Commission’s stakeholder conference on the circular economy in Brussels on 25 June. 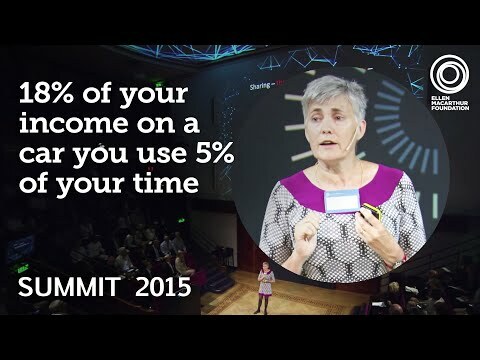 The Circular Economy 100 (CE100) Annual Summit returns for its third year, with presentations from Jim Andrew of Philips, Estelle Brachlianoff (Veolia), Robin Chase (Zipcar), Kathryn Garcia (New York City) and many more. The Foundation launches Circulate, a new online hub for news, editorial and insight on the circular economy and related subjects. Circulate is the go-to location for circular economy related news and insight, with fortnightly featured articles, regular updates from a team of international correspondents, daily news pieces and our recommended reading from other writers and publications. Ellen MacArthur presents on the circular economy at TED2015 in Vancouver, Canada. The annual conference focuses on the theme of ‘Truth and Dare’ to find a richer understanding of ideas that will shape our future. Ellen shares her journey and insights on the circular economy in ‘Endgame’, the closing session of the conference. The video of Ellen’s presentation was released later in the year, and gained half a million views in the first week. In October 2014, the Foundation hosts the first online Disruptive Innovation Festival. The DIF is an open access event that invites thought-leaders, entrepreneurs, businesses, designers, makers and learners to explore the question “the economy is changing - what do I need to know, experience and do?”. The DIF is a devolved event, with more than 200 sessions on subjects like biomimicry, the sharing economy and internet of things taking place over a three-week period around the world; coordinated and accessible on thinkdif.co. Sessions are held across six virtual ‘stages’, ranging from the thought-leading Headline Acts to the Open Mic stage, composed of completely crowdsourced content. DIF 2014 saw over 225 hours of free sessions, 10,000 registered attendees and 950,000 website impressions from 170 countries. The Ellen MacArthur Foundation announces Andrew Morlet as its new Chief Executive Officer. 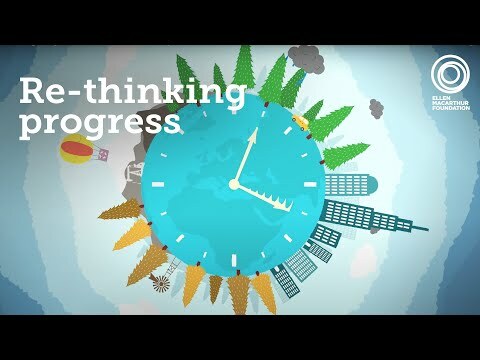 Re-thinking Progress: Educating for a changing world is the Ellen MacArthur Foundation’s first ever education open-house event in partnership with Bradford University’s centre for the circular economy. Over three days experts, academics and thought leaders from around the world present at the University of Bradford’s re:centre both in person and via telepresence. Project MainStream is a multi-industry, CEO-led global initiative to accelerate business-driven innovation and help scale the circular economy. MainStream aims to fast-track this transition by taking collaboration to a new level, focussing on stalemates that individual organisations cannot resolve. Unilever joins Cisco, Kingfisher, Philips and Renault as the latest Global Partner to the Ellen MacArthur Foundation. The partnership will focus on supporting Unilever as a pathfinder in unlocking the value of the circular economy within the fast-moving consumer goods (FMCG) industry. A New Dynamic makes the contemporary case for a profound shift from throughput and a linear ‘take-make-dispose’ economy to a circular economy that is restorative and regenerative. Featuring some of the leading thinkers and practitioners in the field including Walter Stahel, Michael Braungart and Amory Lovins, the volume offers a comprehensive overview of the model, business case studies, the performance economy, history and development and the entrepreneurial opportunities of these fluid times. The second Circular Economy 100 Annual Summit is held in London. Ali Velshi of Al Jazeera America facilitated the day, which was split into three sessions on leading company innovations for a circular economy, big issues and opportunities such as finance, energy, water and Asia, and future design and manufacturing. 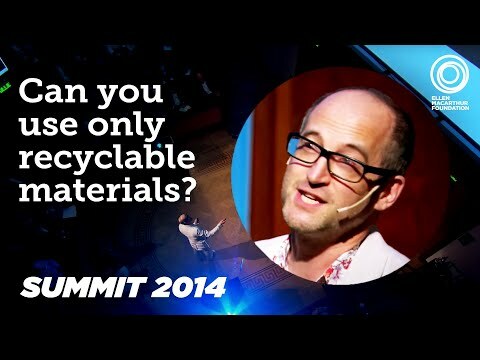 When we hosted the first summit one year ago, we were still very much setting the framework of the circular economy, bringing together the thought leaders and sharing ideas. Within twelve months, in many cases, we have moved to sharing best practice. I think that’s a very positive jump to make and is what the entire Circular Economy 100 is all about. 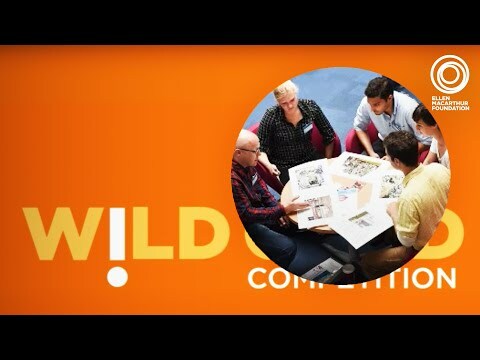 An addition to the Schmidt MacArthur Fellowship, the Wild Card Competition is opened to postgraduate students studying design, business or engineering and their faculty mentors from any university in the world to innovate for a circular economy. The winner joins 14 other students from leading universities including MIT, Yale University, Stanford University, Tongji University, National Institute of Design, India and London Business School. The Ellen MacArthur Foundation reaches its target of 2,200 schools in the UK actively using circular economy educational resources and professional training (over 50% of all UK schools). The UK becomes the most advanced practice space for piloting circular economy teaching and learning. Philip's mission is to pioneer circular economy innovation in the areas of healthcare, consumer lifestyle and lighting. The first Circular Economy 100 summit takes place at the Royal Institution of Great Britain. Speakers included renowned thought leaders including Prof. Dr. Michael Braungart, William McDonough, Janine Benyus, Jeremy Oppenheim, Rachel Botsman and Eric Schmidt – making it the largest gathering of circular economy experts to date. The MBA is created in partnership between the Foundation and Bradford University School of Management. The Foundation teams up with the Schmidt Family Foundation to launch the first global postgraduate fellowship programme in the circular economy. The programme works with Partner Universities including Yale University, Stanford University, London Business School, India’s National Institute of Design and many more of the world’s leading universities, to catalyse circular economy innovation. With an exceptional response from businesses wanting to understand how to unlock the opportunities outlined in the reports, the Circular Economy 100 is born. This alliance of 100 global corporations, emerging innovators and regions works towards building circular economy capability, triggering over $10billion of economic benefit for the members involved and working to bring the concept to scale. The Foundation returns to Davos the following year with another report that scales up its analysis and looks at the global opportunity for fast moving sectors of the economy. The presence of circular economy sessions at Davos 2013 has already increased five-fold since the launch of the first report the year before. The manifesto states that ‘In a world with growing pressures on resources and the environment, the EU has no choice but to go for the transition to a resource-efficient and ultimately regenerative circular economy’. Ellen is invited by the EU Commissioner Janez Potočnik to work alongside the European Resource Efficiency Platform. “Towards the circular economy”, the first ever economic report examining the potential of the circular model, is published by the Foundation, with analysis by its knowledge partner McKinsey & Company. Launched at the World Economic Forum in Davos, the report quantifies the $630bn value of the circular economy opportunity in Europe. Ellen appears on BBC World live from Davos to share the report findings. The Foundation releases this fun, three-minute animation on the circular economy model. The video was watched 80,000 times in the first week, and remains YouTube’s most viewed video on the circular economy. Across the UK, 150 students from 24 schools take part in five hands-on workshops on the circular economy. The launch of Project ReDesign challenged students to re-think whether our current waste problem is in fact a materials opportunity, by exploring the possibilities of a systems level re-design. The winning groups went on to take part in week-long internships with our Founding Partners in July 2011. The coherence of the circular economy framework and its perceived potential as a genuine economic paradigm shift convinces B&Q, BT/Cisco (working together), National Grid and Renault to become Founding Partners of the Foundation. The next four years sees Ellen meeting with experts across a variety of countries, economies and industries to better understand our global approach to the way the economy uses resources.